Possibly the most impactful material in the nanotechnology arena, carbon nanotubes have spurred a tremendous amount of scientific research and development. Their superior mechanical and chemical robustness makes them easily manipulable and allows for the assembly of various types of devices, including electronic, electromechanical, opto-electronic and sensing devices. In the field of nanotube devices, however, concepts that describe the properties of conventional devices do not apply. Carbon nanotube devices behave much differently from those using traditional materials, and offer entirely new functionality. 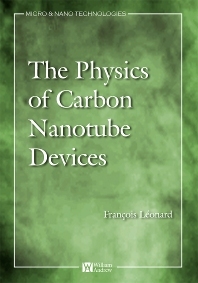 This book – designed for researchers, engineers and graduate students alike – bridges the experimental and theoretical aspects of carbon nanotube devices. It emphasizes and explains the underlying physics that govern their working principles, including applications in electronics, nanoelectromechanical systems, field emission, optoelectronics and sensing. Other topics include: electrical contacts, p-n junctions, transistors, ballistic transport, field emission, oscillators, rotational actuators, electron-phonon scattering, photoconductivity, and light emission. Many of the aspects discussed here differ significantly from those learned in books or traditional materials, and are essential for the future development of carbon nanotube technology. • Bridges experimental and theoretical aspects of carbon nanotube devices, focusing on the underlying physics that govern their working principles • Explains applications in electronics, nanoelectromechanical systems, field emission, optoelectronics and sensing. • Other topics include: electrical contacts, p-n junctions, transistors, ballistic transport, field emission, oscillators, rotational actuators, electron-phonon scattering, photoconductivity, and light emission. • Covers aspects that significantly differ from those learned in traditional materials, yet are essential for future advancement of carbon nanotube technology. Explains applications in electronics, nanoelectromechanical systems, field emission, optoelectronics and sensing. Covers aspects that significantly differ from those learned in traditional materials, yet are essential for future advancement of carbon nanotube technology. Engineers/scientists in industry and national labs with graduate level training or with extensive work experience in research.